Sonokinetic Steelpan is our take on the Steel Drum or Steelpan popularized by the people of Trinidad and Tobago. 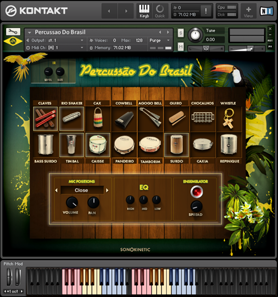 A tropical joy emanates from every touch of this beautiful instrument. Steelpans are handcrafted from the wealth of oil barrels that proliferate the Island State. They are a low-tech by-product of big industry and a testament to the creativity of whoever it first was that heard the music in these barrels and started to tune and cultivate them into the musical instrument of today. We decided to capture that sound using our proven methods, with two different types of sticks and additionally with our fingers. The finger-tapped sound not normally common to Steeldrum playing but we really loved the timbre when we experimented with the instrument and felt we needed to share it with you for inspiration outside of the usual use of the instrument. 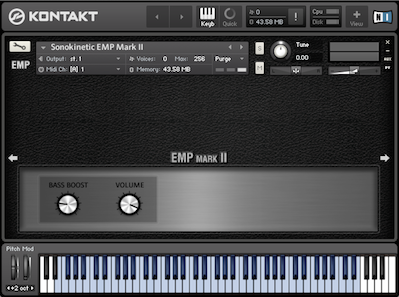 To easily accommodate the distinctive playing method of this instrument we also included an automatic tremolo setting that will alternate between two notes when two or more notes are held together. Rapid tremolos are made easy for those of you with less nimble fingers. 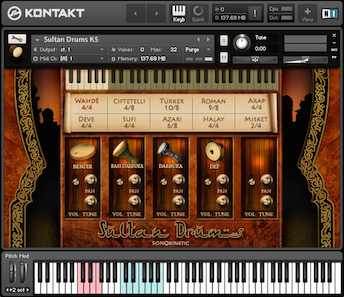 With a beautifully crafted themed user interface designed by Ryo Ishido, we are very proud and pleased to present to you the next step in our traditional music cultural heritage, “Steelpan"
The basic mode of playing Steelpan is to select one of the 3 available mallets (as explained above) and then trigger them on the keyboard within the blue keyrange. The recording of each type of mallet includes a great many round robin samples. In normal playback these will cycle through, each time they are played. If you want to, you may exclude certain round robin variations from the cycle using the upper MIDI keys from G5 to F#6. Each key represents an individual round robin sample. Play a key with low velocity to turn that variation off (key will turn yellow), high velocity to turn it on (key will turn red). The MIDI key at B4 will reset the round robin cycle to the beginning. 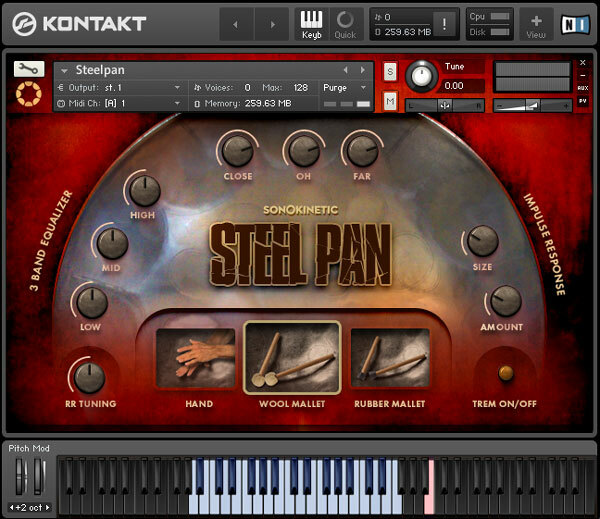 All of the controls for Steelpan are featured on the main Kontakt UI. These include: hand / wool / rubber mallet selection, EQ controls, microphone mixing, RR selection and tuning, convolution reverb and tremolo. Click on the graphic of either hand, wool or rubber mallet to choose the method that the steelpan is struck. Hand playing has the softest timbre, wool is a medium strike and rubber produces the hardest and most defined tone. 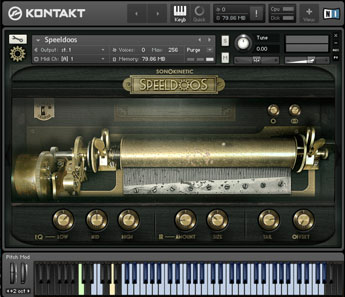 The EQ section, shown here, allows you to quickly and simply tweak the levels of the low, mid and high frequencies. Simply click and drag. Cmd / ctrl click to reset. 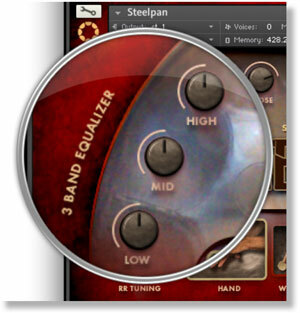 The EQ settings apply simultaneously to each of 3 different mallet selections. A common technique when performing live on a steelpan is to create a fast tremolo between two different notes. This can easily be emulated with Sonokinetic Steelpan. Hold one note in the playable range and then press another. A tremolo crescendo will be played until you release the notes. The Steelpan instrument was sampled with 3 different microphone positions: Close, Overhead (OH) and Far. 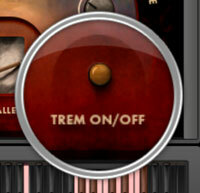 This section of the interface gives you control over the mixing of these positions. Simply click and drag to adjust the levels of the 3 dials. Cmd / ctrl click to reset. Steelpan comes preloaded with a convolution reverb sampled from an actual space to simulate a realistic environment. 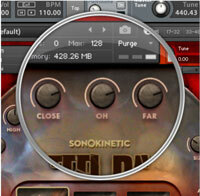 This control makes it easy to quickly dial in some realistic reverb without too much fuss. 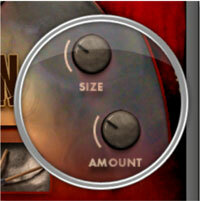 Adjust the wetness and size of the reverb by click-dragging on the dials shown here. Ctrl / cmd click to reset the levels to default.